# In C++ before using any variables, functions, classes and types or compound types needs to be declare first somewhere in your C++ program. # Where you declare or define them, decides their visibility. # Visibility means whether you can use that everywhere or somewhere in your program. # A list of variables that can be used anywhere in your program without even declaring and defining them are GLOBAL variables. # Those who exists in some defined code blocks. # outside that code block they does not exists. 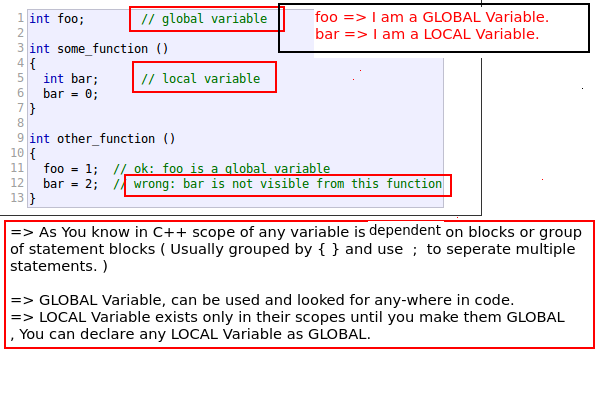 # sometimes local variables are used to protect GLOBAL variables. 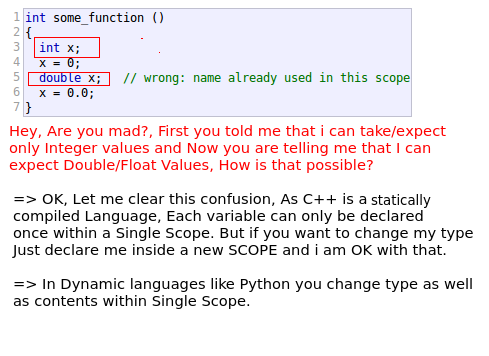 # In C++ you can declare a identifier once within a single scope. # In C++ visibility of Identifiers is influenced by curly brackets that is used to group more than one C++ statements together. 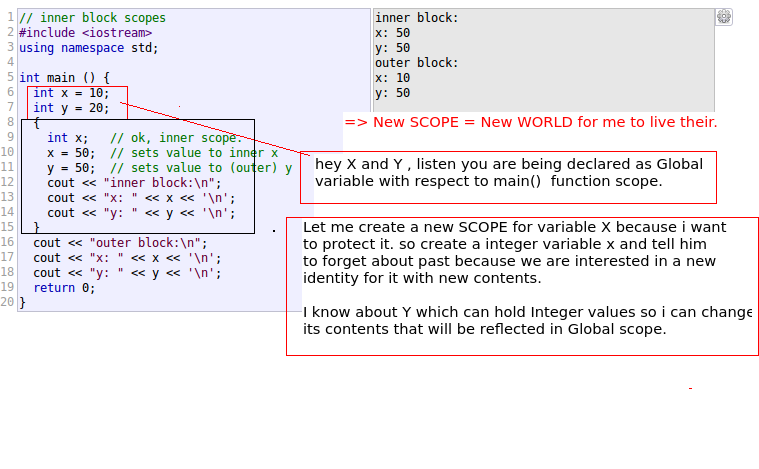 # This means you can create a new scope/world for your new/old variables. # Namespace is a C++ Identifier that used to group some code functionality within a single name of identifier. standard C++ functions/routines, Global variables, Classes. 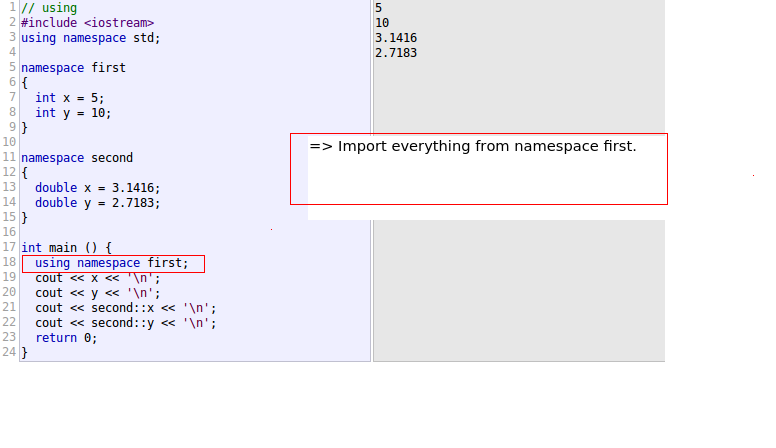 # This is how you can access any function or routine from std namespace even without importing anything from there. # If you know Java/C#, than you may be familiar with this concept. # Importing selected Identifiers from any Namespace ? 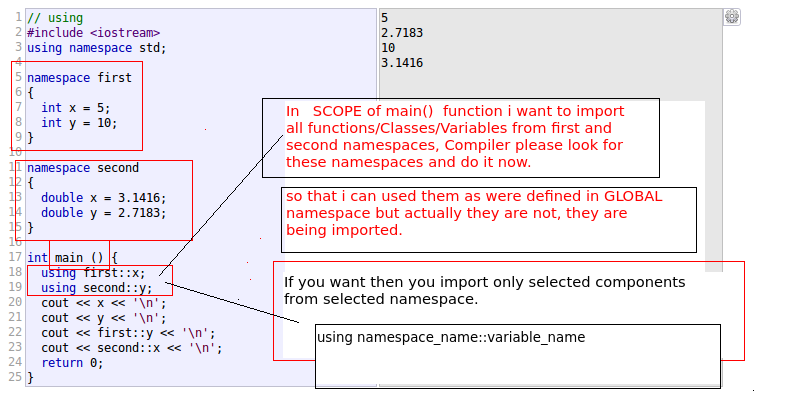 # Importing everything from selected Namespace into current scope ? # scope matters while importing anything from any Namespace. # Static , Global, and Local variables ?